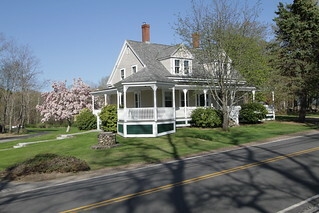 Staples Cottage is located at 938 Main Street, and was built by Charles Rogers. ‘Abdu’l-Bahá hosted a Unity Feast for the people of Green Acre and Eliot here on August 20, 1912. The building was also home to the first National Spiritual Assembly of the Bahá’ís of the United States and Canada, elected there in 1925. In September 2011, the Green Acre office was moved to Gregory Cottage, at 61 Green Acre Drive, next to the Sarah Farmer Inn. Staples Cottage is currently closed.